Yeah; I attended my first EF Low Mass the other day--justabout blew my mind. I was referred to your site by someone else. I'm an ex-Catholic, now member of the Pioneer Church in the UK. I hope you don't think me rude when I say the sumptuous pictures of churches and saints you file brought back a cold wind from my youth - a church that was all show and no substance. I'll try and sum up the difference, as I see it, between an Evangelical and a Catholic with the following story. He was told he would have to go through the traditional channels, contact his senator, file a petition and hopefully, this bureaucracy would eventually get his question to the President. The boy led him through the main gates, through the front door of the White House and along a corridor. No one stopped them or asked for identification. Soon they reached a large door which the man knew must be the door of the Oval Office. The boy opened it and took the man in with him to where President Lincoln was sitting at his desk. The President looked up at the man then turned to the boy and said: "Robert, son, what can I do for you." The boy replied: "Dad, this man needs to speak with you." You see, the Son has direct access to the father. Straight in. Not that we are worthy, not because of who we are, but because of whose we are - God's children. Oh, you Catholics will get into heaven. But you will be the last there. Why? Well, because you all prefer the long way round. You prefer the spiritual bureaucracy of devotions, suffering, rosary, suffering, Liturgy, suffering, petitions, novenas, suffering, and more suffering. All of which, like rich red robes or Latin phrases, can be comforting and addictive, yet also time wasting. We Evangelicals will see you coming in the distance and we'll get a meal ready for you. We won't ask 'where have you been,' because we will know. And it won't matter then. We will all be sitting down to the heavenly banquet. There is a danger we take ourselves too seriously, so I'll sign off with a joke. A non-judgemental Protestant, an open minded Catholic and Santa Claus were in a lift when they spotted a $100 bill lying on the floor. Who picked it up? Santa, of course; the other two don't exist. weird, because H of C is also the first I go to, then I go here to get the links he hasn't... apologies to everyone for not updating my bloglinks - it just takes so long to do it...and half the time they don't work ! Faccio La Mamma... we've met?? Go on: do tell. I'm consumed with curiosity... Send me a comment, and I promise I won't publish it!! Welcome to my little blog... I hope you've enjoyed reading it (and looking at the pictures) as much as I have enjoyed writing it. I would love to know who sent you in this direction... and why? 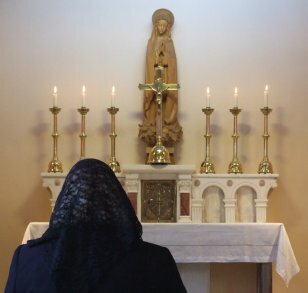 In the meantime, I'll just say that Catholics believe that Jesus himself is physically present in the Blessed Sacrament, and that is who we receive in Communion, and adore in Exposition, and because the Blessed Sacrament is reserved in the Tabernacles in each of our churches, we want to give of our very best: hence the emphasis on beautiful things in our churches, sights, smells, sounds... and our concern when this is skimped: one shouldn't give God second best. I don't believe that only Catholics will get to heaven, and I am certain that many non-Catholics will get there a lot faster than me (I have a lot of time in Purgatory ahead of me!) However, I don't believe that it is timewasting to put one's faith in the Church which Christ founded: Thou art Peter, and on this Rock I will build my Church. BTW, I liked the joke! I did it. Wasn't even tagged. How sad is that? Done. Thanks for the tag... I think. I believe you are on Fr. Z's blogroll. Homework done, Miss. You really wouldn't remember me, Mac, so a name wouldn't help. I'll say this, though (and I don't mind if you don't publish it): when you first came to a Faith Conference, you hand poor Roseann and Ann pulling their hair out, as they'd thought 'Mac' was male and had assigned you a room in the male wing! Faccio la mamma - I remember the consternation... and blame Fr Stephen Boyle who twisted my arm persuading me to go at the last minute... and he did the booking on my behalf! !